ForexAurum Fibonacci indicator is a useful tool for traders who are using Fibonacci combined with the ZigZag indicators. 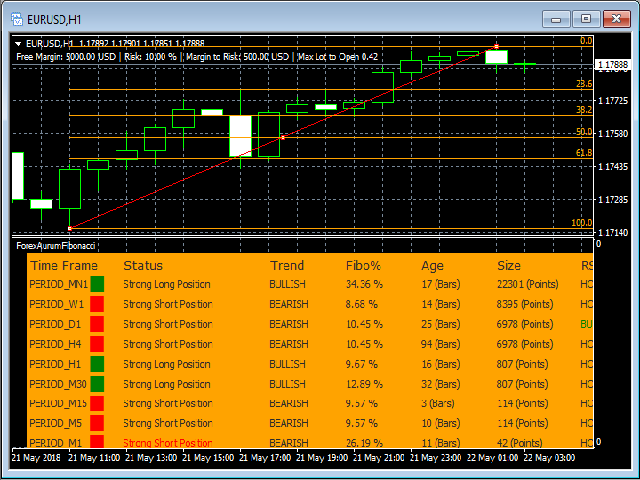 It uses the real-time calculation of the levels for all the timeframes and displays the results for you. In addition, you can setup RSI, ADX and Stochastic indicators to confirm entries. Just drag and drop the indicator on an 1 minute chart of any symbol. Then you can switch to a higher timeframe at anytime after the initialization. Always drag and drop the indicators on 1 minute chart. Use the Fibonacci to determine the support and resistance on higher timeframe (1 hour and 4 hours). Use the other indicators to confirm entries on lower timeframe (15 minutes). Risk %: The indicator uses this parameter to calculate the maximum lot size you can open based on the free margin. Debug Log: Activate debug log can be needed for support. RSI_PARAM: Delimiter for the RSI parameters section. RSI Period: the RSI period, 14 by default. RSI Max Level: the overbought level, 70% by default. RSI Min Level: the oversold level, 30% by default. ADX_PARAM: Delimiter for the ADX parameters section. ADX Period: the ADX period, 14 by default. ADX Level: the trend strength, 30% by default. STOCHASTIC_PARAM: Delimiter for the Stochastic parameters section. Period of the %K line: 5 by default. Period of the %D line: 3 by default. STC Max Level: the overbought level, 80% by default. STC Min Level: the oversold level, 20% by default. All your remarks are welcome, please do not hesitate to contact us.